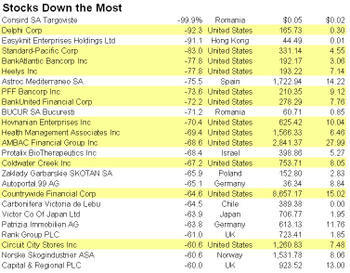 Below we show the stocks that have moved the most so far this year. 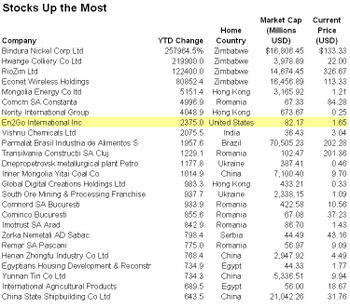 Bindura Nickel Corporation of Zimbabwe is up the most (257,964%), and Consird SA Targoviste is down the most (-99.9%). It is notable that on a strictly year-to-date and percentage basis, only 8 of the top 25 stocks are incorporated in Asia, while 9 are incorporated in Eastern Europe. US equities are highlighted.